One of the tips sent to me during the Alea Tools Markers contest is one I'd used in the past and somewhat forgotten about. 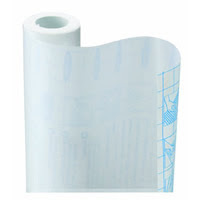 Clear contact paper is a great, cheap alternative to using lamination film. I used to use this all the time, up until I was able to procure a huge roll of lamination film for cheap from a teacher's supply store. The paper is slightly opaque, which doesn't matter too much when used as lamination, but the material also has a bit of super-fine texture which has a bit of "bite" when using certain markers. Clear contact (actually Con-Tact is the brand name) has a bit of thickness to it which is also very useful. When working with paper miniatures printed at home I've found that a lot of times the minis aren't thick enough to get a good grip in the miniature bases, or at least the cheap plastic ones. With thicker cardstock I've been able to get by with just using clear packing tape, but a lot of home printers don't do so well with the thicker cardstock. If you can manage a thinner cardstock or even just regular paper, this clear contact paper, applied front & back, can give enough extra body to the mini to get it to fit. While you are at it, you should check out some of the other contact papers available. Some of the other colorations lend themselves to interesting applications. Need a quick and cheap marble wall? use the marble colored contact paper on a wall made out of cardstock.